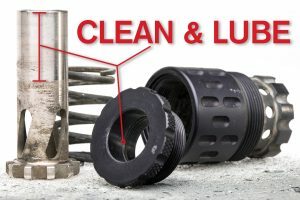 Since we’ve already answered the Should I Clean My Silencer? 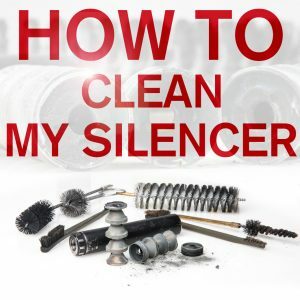 query, now we can tackle the fun part: How to clean a suppressor. 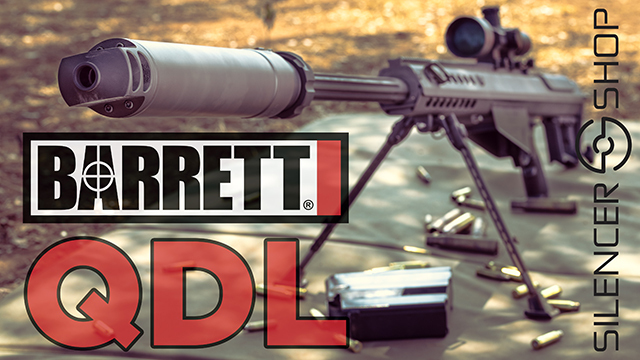 If you own a rimfire or a pistol can, this writeup is calling your name. As for you higher caliber suppressor owners (e.g., 5.56mm, 7.62mm, and large bore), you know from our last post that most rifle units are self-cleaning, but feel free to read along anyway! “There’s more than one way to skin a cat.” Be sure to keep this popular idiom in mind when reading the below information because it’s certainly applicable. By no means does this entry cover every base regarding servicing a silencer, but we’ve attempted to provide the most common and beneficial options. When it comes to servicing a silencer, there are several options at your disposal to reach the end goal: a high-performing, fully-functioning can. However, it’s important to avoid damaging the suppressor itself and its components, which (unfortunately) is easily achieved when utilizing certain toxic chemicals and abrasive devices. As mentioned in last week’s post, rimfire cans are the main culprits in terms of dirtiness due to the filthy, unjacketed .22LR ammunition run through these models. And although pistol cans generally use at least partially jacketed ammo, these units are prone to modest lead buildup, which directly affects performance. Generally, there are two troublemaking culprits that accumulate within silencers: carbon and lead. Both “ingredients” are what you should target to clean off your recently used cans. Carbon, as seasoned gun owners are all too familiar with, is the byproduct of combustion in the chamber/barrel that accumulates as black residue pretty much everywhere. Lead, on the other hand, directly involves the projectiles that travel through the firearm’s barrel. As the projectiles make their way through the rifled barrel, minute grooves in the barrel “peel” off small slivers of lead and dispense them throughout the silencer’s interior. Not often found on the flat surfaces of cans, this silvery, rigid buildup typically accrues within the nooks and crannies. Power tools consist of the more extreme forms of servicing a silencer, specifically ultrasonic cleaners, brass tumblers, and polishing tools. It’s imperative to be careful when utilizing any of these options because each is considered a timed method and requires your attention. For instance, don’t leave aluminum baffles in a tumbler for an extended period or they’ll be reduced to useless nubs. And be extra careful with ultrasonic cleaners as they can erode finishes, namely Cerakote. Based on our experiences, we’ve found the most effective and safest method is also the easiest: Simple Green, a handy toothbrush, and a reliable toothpick for the stubborn spots. There’s far less risk in damaging silencers if you roll up your sleeves and use some elbow grease to thoroughly clean each rimfire and pistol can in your arsenal. Aluminum: Do NOT use ultrasonic cleaners, harsh solvents, or steel brushes/picks. To avoid permanent damage, only use safe chemicals and brass or plastic utensils. Stainless steel: Use essentially anything… It’s not rocket science concerning this material, but tread lightly when using certain chemicals (e.g., paint thinners, hydrogen peroxide, “the dip”) due to the reaction created between the metal and the solvent. You don’t want your Q El Camino to be unpretty. Titanium: See stainless steel. Moreover, brass tumblers seem to work well cleaning both titanium and stainless steel models (e.g., Sig Sauer SRD 45, AAC Ti-Rant 9M). Considering rimfire and pistols cans alike are comprised of various components, it’s important to prioritize which areas need the most TLC. 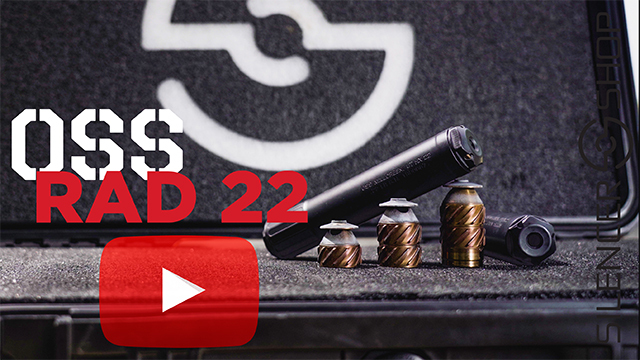 Let’s dissect the primary pieces of a suppressor and how to treat each. 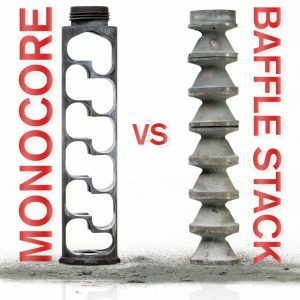 Monocore/baffles: Depending on its design, the innards of your silencer are either a monocore or baffle setup. The flat surfaces are easy to clean, but the internal details can sometimes be problematic, even though buildup is often visible. Utilizing the solvent/toothbrush method works just fine. If needed, use a toothpick for the nooks and crannies, paying special attention to the places where metal meets metal. Tube/endcaps: Chalk these components up to being a breeze to maintain. 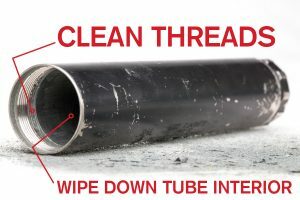 Because monocore/baffle removal essentially cleans the tube internally, all that’s needed is a simple wipe down with a twist cloth to remove minimal debris. Use the same cloth to wipe down the endcaps. Threads: Much like the tube/endcaps components, a quick wipe down – or pass through with a toothbrush - will suffice the threads. Done and done. Boosters: Some setups require the use of boosters. Merely remove the accompanying booster and wipe/lubricate as needed. It’s imperative that the interface between the piston and the housing is clean of debris or the booster could malfunction. O-rings: These lil’ guys are almost always located between the booster housing and the piston. A gentle clean and lube allow O-rings to fully function… Ultrasonic cleaners and other solvents degrade the O-ring material, so use caution when servicing (or avoid altogether). And take a mental picture of where it’s housed for replacement during reassembly. With all of the preceding said, keep in mind that it’s always a good idea to refer to the silencer’s user manual for general care insight. Whenever in doubt, this guide provided by the manufacturer offers the best maintenance options for keeping your specific can clean. When you encounter a silencer that is being stubborn to take apart, a quick range trip can help (sometimes you just need an excuse to go back out). Heating the silencer up will often aid in the disassembly process. Just be careful not to try this when the silencer is TOO hot! (For safety sake, use a Silencer Shop removal tool when in doubt.) It’s advantageous to remove a very dirty silencer at the gun-run while still warm. Obviously, adhere to all gun safety and range safety rules. Even more, that can be a perfect time to remove the monocore/baffles from the outer tube. Once home, take the necessary precautions—wear gloves and goggles—to ensure a safe cleaning experience throughout. 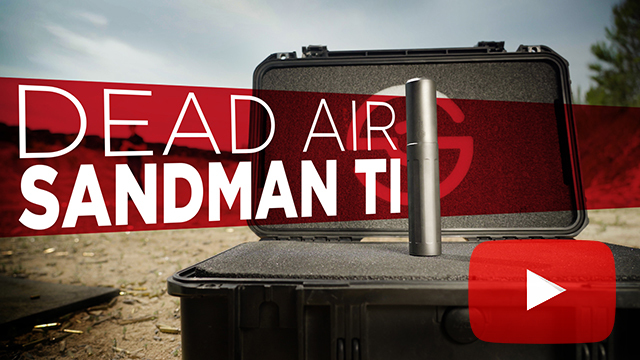 Regularly scheduled maintenance of your rimfire and pistol suppressors increases their performance and longevity. As always, contact us with any questions you might have regarding all-things silencers. 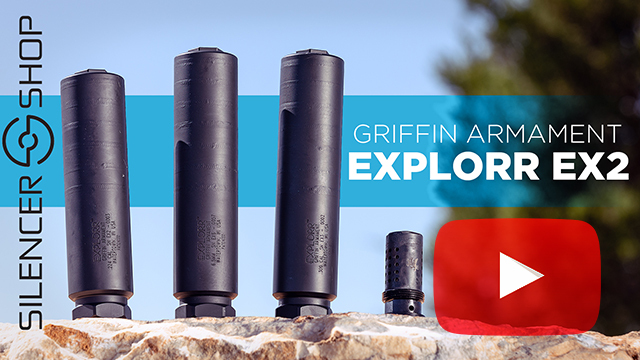 Moreover, if you have personal triumphs/helpful hints regarding suppressor maintenance, please “Leave a Reply” below for your fellow silencer enthusiasts. Here’s to clean and safe shooting. I'm getting (counting the days) a used AAC Avenger 9 mm can. It's aluminum and non-disassembleable (is that a word?). i.e. I can't take it apart. Looking for suggestions on cleaning. I've heard that an ultrasonic cleaner is a no-no because the standard chemicals can hurt the aluminum and destroy the anodizing. Anyone have ideas? There is not one style that is the best. Different silencers have advantages over others. It really depends on what you are looking for. I have an old SWR HEMS II suppressor. The piston seems to be fused to the b Interior wall of the booster assembly (either by the ears or at the actual faces, I canâ€™t tell). I used this with a fixed barrel spacer without cleaning frequently enough, I think. I tried sealing the can and soaking the internals with Kroil overnight. That didnâ€™t work. Can you recommend any solvents that might be safe for that can, or perhaps another procedure? We have had good luck with Fire Clean. It might take a variety of methods to finally break it loose. PB Blaster works well with breaking up carbon and getting into the parts. Just make sure that you donâ€™t mix chemicals that could cause a reaction. I have an Issis-2 and have been putting high temp never sieze on all threads but I still have a hard time removing the end cap after shooting a couple hundred rounds. I only tighten it finger tight. All the other threads come apart easily. I tried loosening the end cap right after shooting before it had a chance to cool down. I still needed to use a strap wrench on the tube to get the end cap to loosen up. Any suggestions? It is more than likely going to be like that for the life of the silencer. It could just be the design. Sometimes carbon gets in those threads and it just makes them hard to take apart. I just recently received my Gemtech GM22. I have about 300 rds through it. Unfortunately thatâ€™s over a two week span. The supressor is really seized up and Iâ€™m starting to damage finish trying to get it apart. Any recommendations on how to do this? I even soaked it in gun cleaner for 30m. That got some gunk out but still wont budge. HELP! You can try using Fireclean. If that doesnâ€™t work you can soak it in Simple Green and water. If that doesnâ€™t work then contact Gemtech for a warranty repair. I have an old Pilot (AAC) 22 can that does not come apart. I use water in it that seems to keep most of the crud in solution. Every few mags I fill it about half full of water, shake well, pour out as much as will drain and shoot some more. I sometime use Simple Green instead of water. I think of it as pressure washing the inside. What drains out is usually quite dirty. It has had at least 6000 rounds through it and it still only weighs 1/10 oz more than it did new and seems to be as quite as ever. I have the Silencerco Sparrow and I place the baffles and the two side panels in a small glass jar filled with Hoppes 9. Then place the jar on a coffee cup warmer for about 4 hours (done in the garage or shed due to the odor). This helps penetrate the lead build up and it's not so hot I can't hold the parts. Three fourths of the baffles clean with ease while the part near the barrel threads require a small brass brush. I've done this process for two years and folks are shocked as to how clean it looks. I clean it about every 300 rounds to keep the maintenance time down to an hour. When cooled I put the lid on the jar until next time. While I appreciate the article I feel there is a huge, potentially life threatening error in the picture, using brake cleaner, while a common practice is extremely dangerous. Brake cleaners when exposed to extremely high temperatures releases hydrogen chloride which can kill. 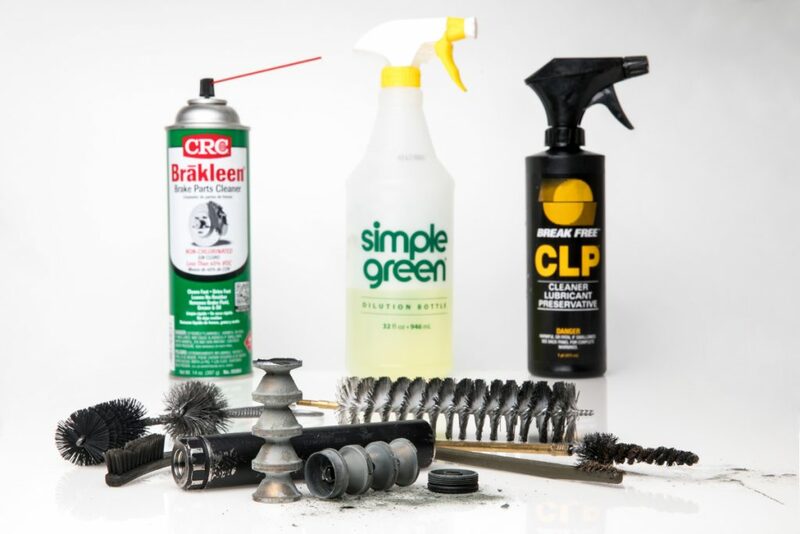 Only if you use chlorinated brake cleaner, the shown cleaner is non-chlorinated and will not release deadly chemicals when heated. Also very important distinction when you are cleaning parts to be welded. That is true. Donâ€™t clean your silencer and then immediately start shooting again if you use brake cleaner. An old timer mentioned just letting the baffles soak in a drain pain with some automatic transmission fluid. He said it doesnt take much and you can even recycle the fluid . Yall ever try that? That works also. Just a little messy. I have a Bowers VERS 45. In your earlier article you indicated that "most" pistol caliber cans can be disassembled for cleaning but I think this is one of the exceptions. While I don't plan on shooting any .22 rounds through it, I do handload and might send some cast bullets down-range. Since I don't think I can break it down, how should I go about cleaning it? I recently received my Radical Firearms RF22 can and I can't find a video anywhere on how to take it apart. Any suggestions? Piece of cake Eric. There is a knurled nut at the front of the silencer that can be grasped and unscrewed. I generally give it a turn or two and then push the nut down before removing it completely to break the monocore free of the outer tube (If the silencer is clean, you donâ€™t need to leave the nut on. It just gives you a little more real estate to push on than the bare threads). If it is excessively dirty, hold the tube and give the loosened knurled nut a couple of sharp taps on a piece of scrap wood or something to break it free. Also, I emailed you some photos. I have SilencerCo Omega and Sparrow silencers. I soak them in cleaning strength vinegar overnight and it does a great job. I follow up with Johnson's Scrubbing Bubbles bathroom cleaner which works great. I use the bathroom cleaner to clean stainless barrels too. I coat the parts with welding anti-splatter spray and let dry. You can use the anti-splatter spray wet in the suppressor too. I spray a bit of white lithium grease on the baffles. The anti-splatter and grease reduces lead deposits. This removes the elbow grease in cleaning. These products are cheap and very effective. Iâ€™m not super familiar with Scrubbing Bubbles but I do know your Sparrow has two o-rings on it. I assume that Scrubbing Bubbles is safe to use on bathroom caulk so it shouldnâ€™t be an issue. O-ringâ€™s are easy to replace anyway if the cleaning method is working for you! I have a Tactical Solutions Ascent for .22 calibers. The first baffles that cam with it could not be cleaned and rings fell off. I used mineral spirits as suggested to clean them. I sent it in to the company and they repaired replace the baffles with titanium baffles. There were no new cleaning instructions sent. Do you have a recommendation? Threat them the same as you would the rest of the baffles. We use simple green and a brush most of the time. I've had an AAC Pilot 2 for a few years and have been using a mixture of 1/2 peroxide and 1/2 vinegar and letting the baffles soak over night. I follow up with a rigid plastic brush to remove any extra fouling. It works well and I've done this several times. Is this acceptable or am I causing undue harm to my can? You can take the liquid leftovers with their water soluble Lead compounds and mix with enough bicarbonate of soda (baking soda!) to precipitate the Lead out as insoluble Lead carbonate. Then dry up the liquid by leaving in a warm, dry SECURE place. Then take the solid residue remaibing and mix it into a small ammount of cement/concrete pre mix, etc. and water. Let the cement harden fully. You can dispose of the resulting concrete chunk with non soluble Lead compounds aggregate more safely/responsibly- I can not speak as to LEGALITY, this varies by locale. That is a lot of work when there are much easier ways to clean a silencer safely. The â€˜dipâ€™ creates lead acetate, requiring haz waste disposal. If you get caught pouring down the drain, it is illegal dumpingâ€¦.and that can be a criminal issue. 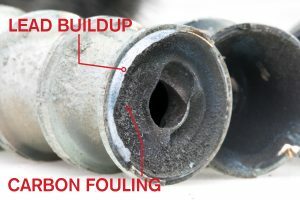 That is what we were referring to when we mentioned â€œthe dip.â€ It is a common method for breaking up the fouling on a dirty rimfire silencer but just be careful with how you handle/store/dispose of the used solution when you are done. That pesky lead is toxic and my personal opinion is that it is a bit more difficult to handle when it is in liquid form. To answer your questions though, that method is totally fine to use. I have a Thompson ISIS II with a mono-core. I coat it generously with gold colored anti-seize lubricant. When you shoot, the lead and carbon get trapped by the lube. The lube also acts lightly as an ablative medium. A quick wipe down and spray of break cleaner and you are done. My Warlock II, 22 suppressor has baffles and I coat them inside and out with the anti-seize lube, as well. Again, a quick wipe down and you are done. What exactly is the â€œgold colored anti seize lube?â€ Are you referring to Permatex 09128 Copper Anti-Seize Lubricant? That is probably what he is talking about. Maybe he will come back and comment on what he was referring to.